My initial reaction to the One-Touch™ Electric Bottle And Food Warmer was that it looked good, the shape and style of the warmer look good in your kitchen, people will probably wonder what funky new kitchen accessory you have bought for yourself! Secondly, is that the One-Touch™ Electric Bottle And Food Warmer is really easy to use, as they say it really is a case of 3 simple steps and you are ‘cooking’. I have tested the unit with various bottles and foods and found it really effective, everything gets heated to the perfect temperature for feeding due to its unique design and clever warming charts. 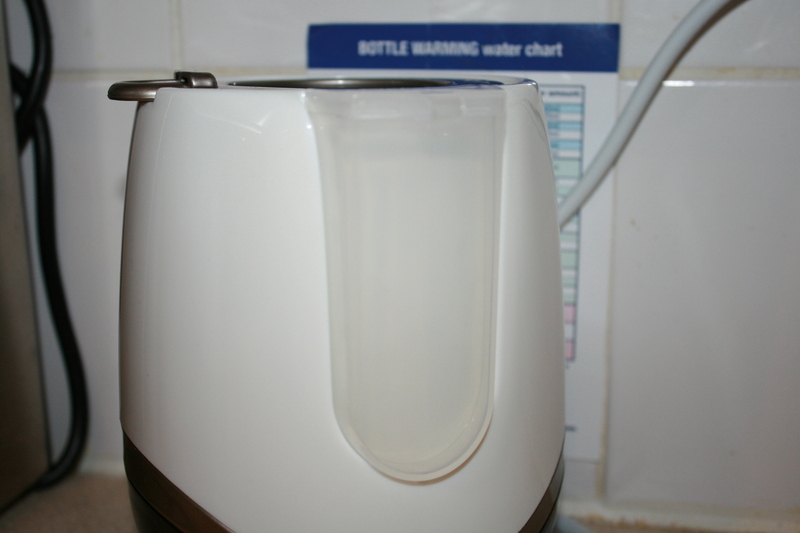 Basically, you put the required amount of water in the unit and it boils until all the water is gone and then switches off, so you know that you can’t damage the warmer by leaving things in too long. The food/milk may get hot if left in the unit so with everything check the temperature before serving. As I make my own foods I thought that I might not be able to use the warmer to heat food but I found that as long as I put food in containers that would fit in the warmer and were safe (plastic or glass as long as it goes in a steriliser) it was fine. I found it really useful to heat the food correctly, even from frozen and in the fridge and a quick stir made sure that it was ready to serve. But the benefit of using the warmer is that you retain vital nutrients that are lost with microwave cooking so it is healthier too – RESULT! You get a handy guide to heating both bottles and food that I have stuck on the wall behind the unit so that I know where it is at all times. 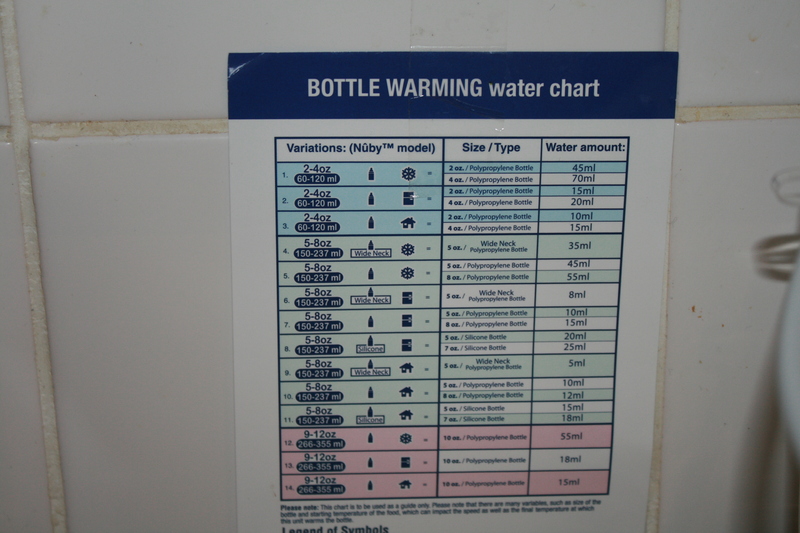 You just choose an option in the first column that best describes the bottle and where it has been stored (ie freezer, fridge etc) and then the type of bottle and how much liquid is in it, then pour in that amount of water and you are good to go! 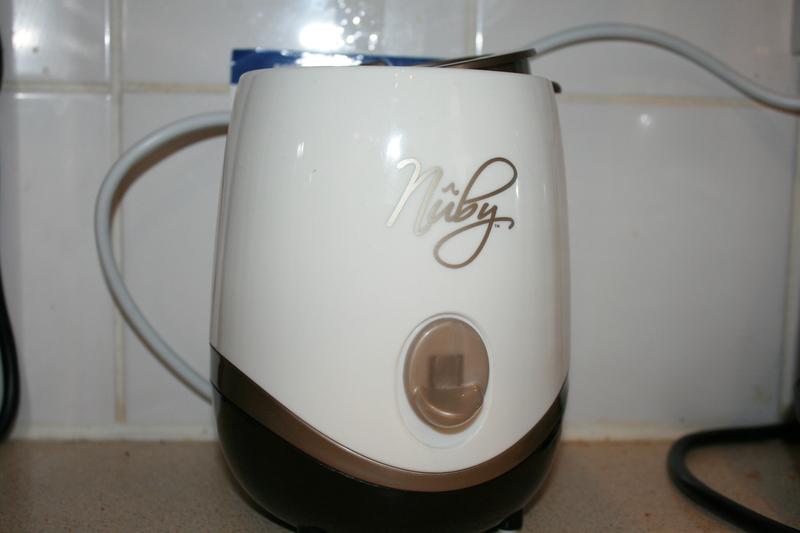 I liked the handy measuring device that comes attached to the Nûby One-Touch™ Electric Bottle And Food Warmer as it meant I always had a quick way of measuring to hand (I always seem to put my measuring jug in silly places!). You just pour the water straight into the unit so once its in there you load the bottle in rack and go! Really easy to use and at £15.00 its good value. A good buy for busy mums! 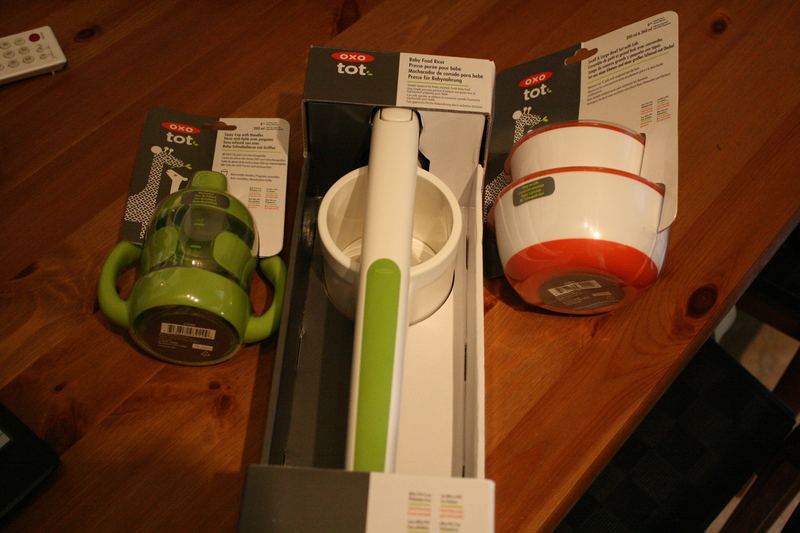 I was sent some items from the OXO Tot range to review. OXO is a housewares brand famed for its universal design philosophy and clever range of kitchen tools. We regularly have requests from the top cooking TV shows for OXO’s tools, and although very trendy in the US, OXO is also known for its dedication to making innovative, stylish yet practical tools to make everyday living that little bit easier. What we thought: The OXO Tot products are great quality, made from sturdy plastic, and in a range of colours. 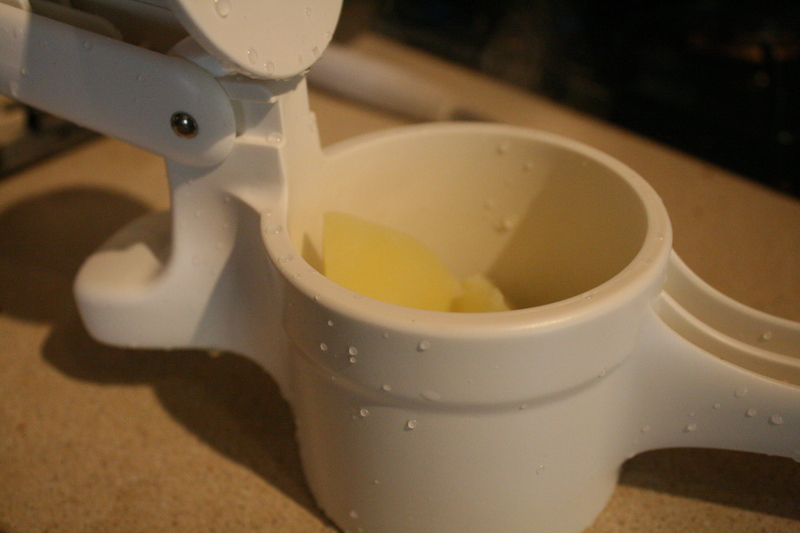 The Baby Ricer is my favourite so far, if you have read my posts in The Wonderful World of Weaning – Homemade Food you know that I love to make my own baby food so this product is great. Its easy to use, even when your fingers get sticky from the riced food, you just pop your cooked vegetables in and squeeze, easy! I was worried about how it would clean up, without a dishwasher sometimes things like this are notoriously difficult to get clean! But it came up sparkling, even after I’d put broccoli through it. 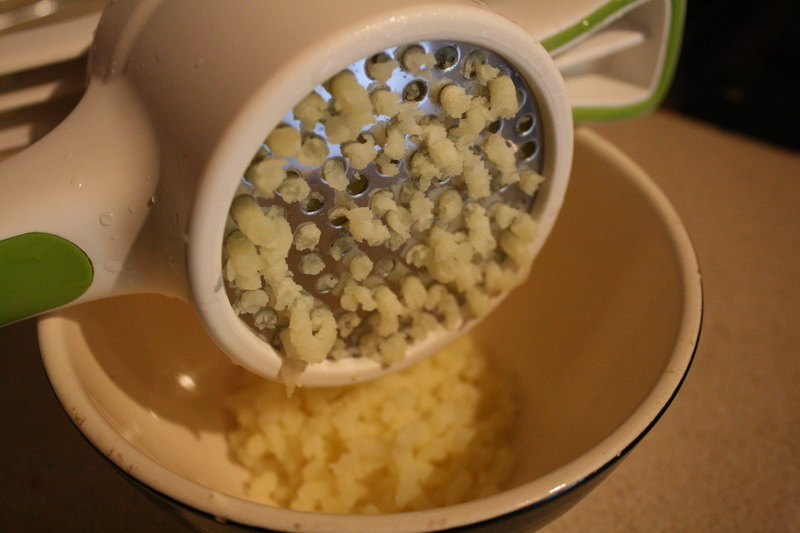 I’ll be using the ricer for our mashed potatoes too, so much quicker and easy than mashing and it made a lovely smooth consistency. So far I’ve tried the following in the baby ricer; potato, sweet potato, carrot, swede, broccoli, cauliflower and peas. Tip – don’t use it for peas – what a mess, stick to your usual hand blender for those! Priced at £16.00 the ricer is good value, when you have finished making mashed baby foods it will still come in for mashed potatoes and similar in the future. I would definitely buy this myself and will recommend it to friends. The Sippy Cup is a bit heavy for LissyLou to hold herself at the moment but is great because when you little one is bigger you can easily remove the handles by slipping them off the cup.Also because they are shaped upwards around the cup little hands won’t slip and slide as much when holding it. The Sippy Cup is £8.00, expensive if you will need more than one, but great quality and it will grow with LissyLou because of the removable handles. If I saw it in store I probably wouldn’t buy it because of the price though, although you wouldn’t be disappointed with the quality. The Small & Large Bowl Set stack inside each other for easy storage, which is a bonus as it means they don’t take up loads of room in your cupboards. When I first picked them up I was surprised by how much they weighed. These bowls are seriously weighty! They are cleverly designed to minimise spills as the weight means they don’t slip and slide around when you are using them. The straighter sides helps you to get food onto the spoon easily. They have great tight fitting lids so that you can re-seal food to store for later or to take food out with you. The Small & Large Bowl Set is £9.00, so more expensive than some others on the market but that does get you the two bowls, and the quality is really good, I would probably buy these for using out and about but have cheaper ones for at home. For more information on the OXO Tots products please visit their website they have a really wide range of products including bath toys, high chairs, clever cleaning items, other food storage options. and some VERY funky nightlights! You can buy the products from Amazon, Kiddicare and Lakeland to name a few! I was sent some Quickasteam Microwave bags to review. They are a brand new creation from the people who brought you ‘Toastabags’ . 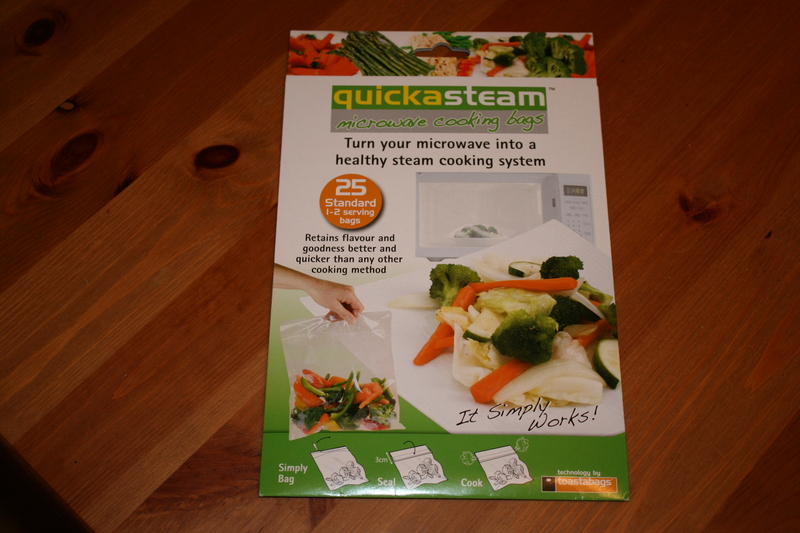 The Quickasteam Microwaveable Bags allow you to steam cook in your microwave, fresh and frozen vegetables, chicken, fish and more, sealing in the natural goodness and taste for a healthy diet . 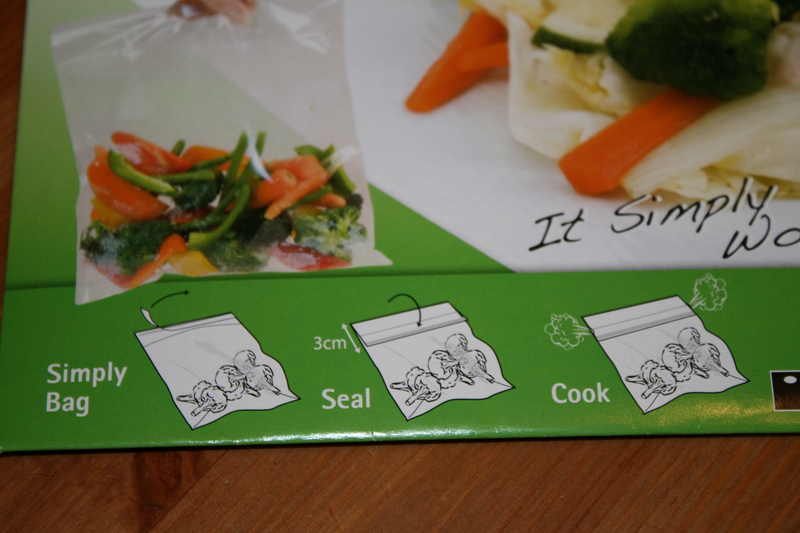 The bags are really easy to use, just fill them up and pop them in the microwave, no plate required so minimal washing up – thank goodness! You also know exactly what has gone in the bag so you know exactly what you will get out, fantastic for LissyLou’s purees! 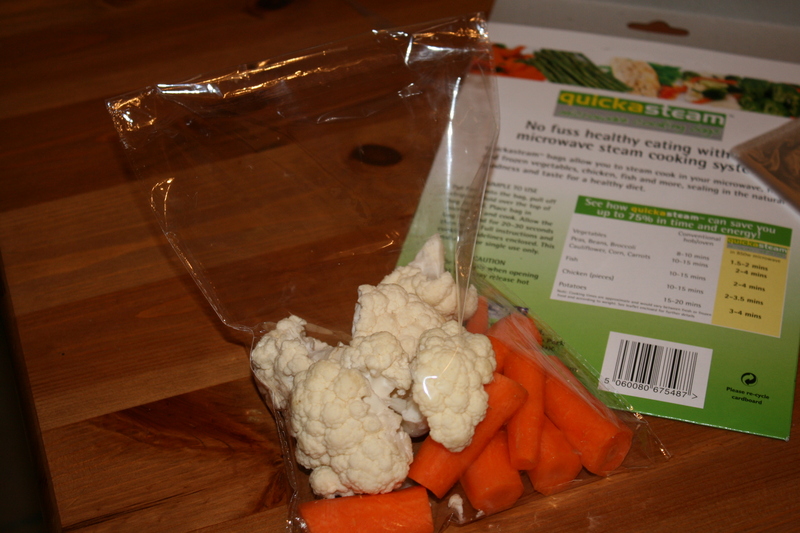 I’ve tried all sorts in the Quickasteam bags, sweet potato, carrots and cauliflower, salmon and frozen peas – they all worked fine, were super tasty and very very healthy! I made some delicious veggies by chucking carrots, green beans and rosemary in the bag – yum yum! For the fish I’d recommend putting it in for less time than they say so that it doesn’t get over done, it will steam beautifully if you pop it in for a minute at a time and keep having a little check! One piece of salmon took about 2mins 10seconds, so its quick too! The Quickasteam bags are cheap at just £1 a pack – 15 Large or 25 Regular, they don’t break the bank and I will definitely be buying more as they are just so useful. 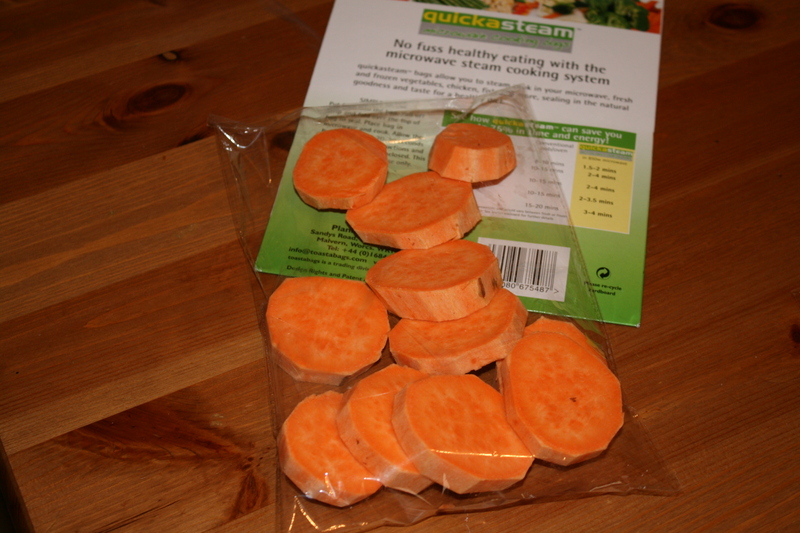 They work great for steaming veggies for LissyLou’s purees and they are supporting me in My Mission RESULT! 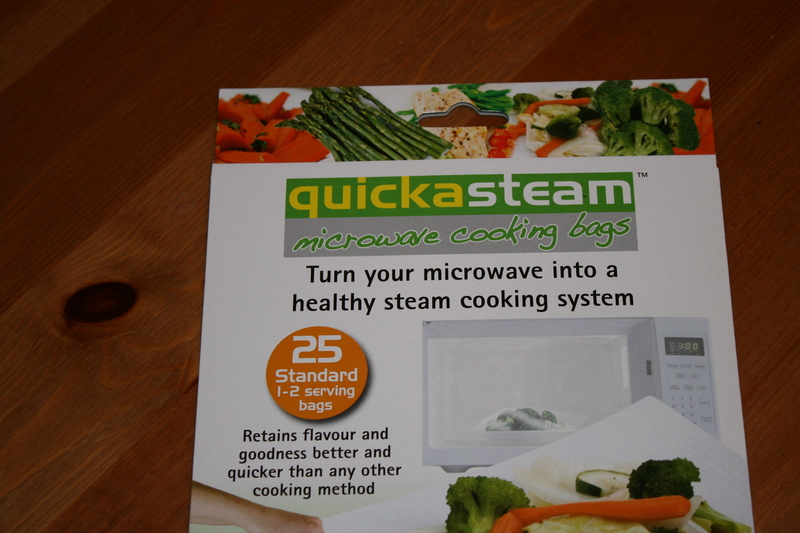 The Quickasteam bags are available from the Toastabags website where you can also buy ‘Cookafish’ and ‘Quickachips’. Innovation at its best! So if you have been reading my ramblings recently you will know that I have talked about homemade baby food and shop bought baby food. If not, take a look at those posts first to put this one into context. So I have split this debate into sections to see which comes out on top! 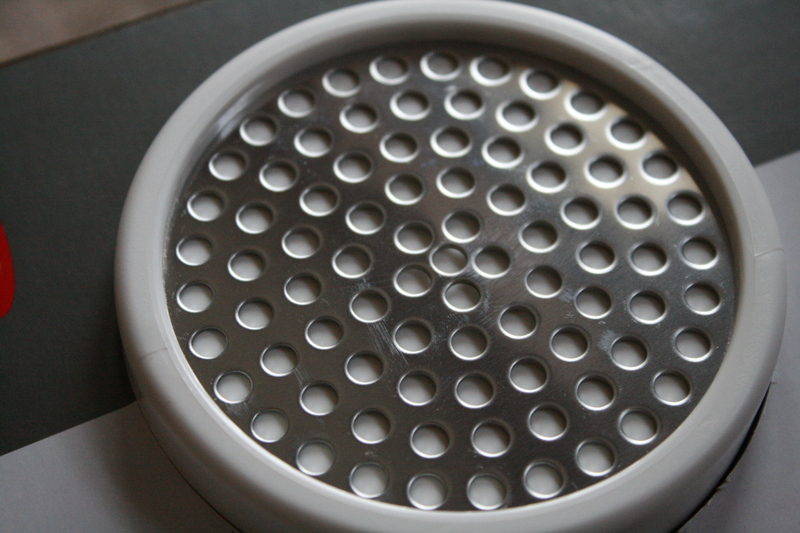 Homemade – Firstly you need some method of pureeing the food so a blender or similar, then you need storage pots, then of course its the ingredients. The blender comes in for other things like sauces and you may already have one in your kitchen. I bought a new one for weaning that cost me about £17, I got freezer storage pots for about £3 for 8 pots. To make a set of 8 pots costs literally pence for basic purees, even fancier more expensive ones will only cost about £2-£3 for 8 so its cheap. I spend about £6 per week for 3 meals a day. Shop Bought – With even basic jars of baby food costing around 60p and organic foods like we tried costing around £1, it is expensive. It would cost me around £16 per week for 3 meals a day using the organic foods. Homemade – I spend about 30mins per week preparing purees, and then about 2mins heating them when I need to use them, I have them all ready to go in their little freezer pots and then just tip them in a bowl to feed once thawed. Homemade – I like experimenting with my purees adding different quanitities of fruit/vegetables until I get the flavour right. LissyLou loves purees and hasn’t turned her nose up at anything homemade yet. Her favourite homemade puree has been Carrot, Swede, Sweet Potato and Potato, although she is also partial to Sweet Potato, Broccoli and Pea. Shop Bought – The organic purees are really good now, they offer tasty combinations and nice consistencies, the fruit ones in particular taste amazing, as we said before we loved the HIPP fruit purees and the Organix vegetable ones. I can’t be swayed from homemade foods for everyday. I find them easy to make, I like knowing exactly what has gone into them and I like the price! I also like the opportunity as babies get older to just puree what we are eating for convenience and to introduce exciting new flavours. However, for going out and about, emergencies and immediate food shop bought has its purpose, and its place. I don’t fault people who use them all the time after seeing the quality of these products now. Its amazing what you can buy! We received some soft tip weaning spoons from Vital Baby to review. You might have already seen them in use in our video, Breakfast, but if not you will find the video at the bottom of the review. Protect your baby’s sensitive gums with our soft-tip Weaning Spoons. Perfect for feeding first solids from around 4-6 months. They are safe for use in the microwave and they are top rack dishwasher safe. Our soft-tip baby weaning spoons are made from safe BPA free materials to conform to EN 14372 standards. I loved the bright pink colour of the spoons, suited my need for girlie things just perfectly. They are also available in blue and orange so there is something for everyone! The curved handle made the spoons easy to hold and maneuver, especially when you are trying to avoid little hands who are desperate to get to their mouth too! They really are ‘soft tipped’, LissyLou found them really easy to eat from, harder spoons at this age are a nightmare as food just ends up going everywhere, but the soft tip makes it easier to get the spoon past her lips, meaning less mess and less fuss! As I don’t have a dishwasher I haven’t tested them there but I can confirm that they are fine in the microwave steriliser, and they wash by hand with ease, they have stained slightly from some of the vegetable purees but this hasn’t effected their use! The Soft Tip Weaning Spoons are £2.99 for a pack of 5, which I thought was very reasonable! They are available from their website.